There is no better way to spend the summer than enjoying the time outdoors with your family and friends. This summer take advantage of the great weather by hosting BBQ parties in your backyard. To help you get ready to grill some burgers and hot dogs here are 30 DIY ideas perfect for your next BBQ. Is your husband the king of the grill? If so make him a fun apron to wear while BBQing. You can make this DIY using the printable design which can be added to a blank apron. Keep your own homemade cocktails in an easy to serve bottles at your backyard BBQ. You can try making your own bottled drinks perfect for the summer with this easy DIY. Keep the bugs out of the food by covering them up with cheerful DIY color blocked food domes that you can DIY. After you have set the patio table with the food place a food dome over each plate to block bugs from landing on the food. You can make your own color blocked food dome by decorating your old food domes with paint and napkin rings. Get rid of your old ugly plastic corn holders and make some new ones out of wood. These modern wooden corn holders are perfect for eating corn on the cob and look stylish too. Treat your family to delicious home smoked food by building your own DIY smoker this weekend. The large smoker will give you plenty of space to smoke a variety of meats and fish allowing you to host a big BBQ party if you wish. Package all BBQ essentials in a wood caddy for the perfect BBQ gift. Inside the caddy, you fill it with an apron, spices, a branding iron, BBQ tools, cans of beer, and a jar of homemade ketchup. The completed gift is perfect for Father's Day, birthday parties or even as a hostess gift. This DIY rolling grill cart is outstanding as it gives you tons of extra storage space. The cart also has useful hooks to hand BBQ tools or hang dish towels from as well.​ Roll it over to your BBQ when cooking to do meal prep, and once the food is ready to be eaten roll the cart to the patio table to transport the food. Give a new look to your old drink cooler by adding some a vinyl decal. You can make your own popsicle decal by having your Circut Explore cut the template on white vinyl. Once the design has been cut, simply peel and stick the design. Make everyone at your BBQ smile with these cheeky burger wrappers. 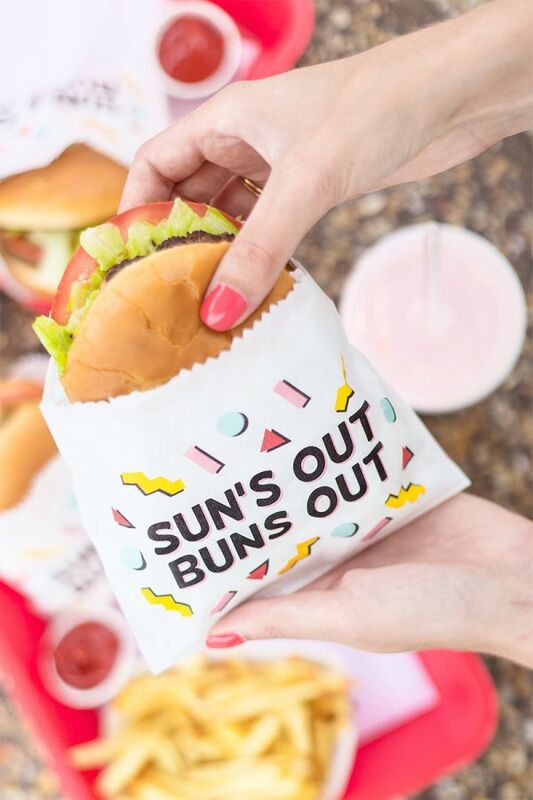 These DIY suns out buns out burger wrappers will help everyone eat their burgers without a mess. To make your own download the template and print the design onto small paper favor bags. While you are busy BBQing keep the kids entertained by letting them play on this cute toy BBQ. All summer long your child will be able to use their imagination to cook their favorite BBQed foods. Decorate your BBQ party with these fun hamburger balloons. You can make your own burger balloons using a yellow balloon and tissue paper. Keep bottles of alcohol cool on your patio table by making a beautiful ice bucket. Instead of a large cooler, an ice bucket will keep your drinks within easy reach on the patio table. If you want to try smoking food or are on a tight budget this DIY clay pot smoker is the perfect DIY to try. Made out of two large clay pots this simple smoker is a wonderful way to smoke meat and fish this summer. Inspired by kabobs of roasted vegetables serve kabobs of fruit for a sweet snack. The handmade stand makes it easy to grab a stick of fruit and looks beautiful too. Place the fruit kabob stand in the center of your table for a healthy snack, that also makes a great centerpiece. Celebrate BBQ season with a burger-themed dessert. Using some fondant and food coloring you can make a banana or lemon moon pie look like a mini hamburger. Stack the decorate moon pies in a plastic platter and serve them at your next BBQ for a no-bake dessert. One essential part of a BBQ is the snacks. Make your own paper snack trays perfect for everyone to fill with chips, pretzels, or other treats. You can make your own trays by using your Cricut Explore to cut the popsicle, watermelon and hot dog-themed trays. After a delicious hamburger, it is only fitting to have a burger-themed dessert. Bake your own mini donuts which can be decorated to look like hamburgers. These mini burgers are sure to be a hit at your next BBQ! Give yourself a counter to place platters of food while you cook with this outstanding DIY. The wood counter is perfect to place uncooked food, spices, or anything else you need near the grill. Cool off after grilling burgers on your BBQ with some delicious homemade popsicles. Unlike store bought popsicles these have a gorgeous color blocked design. The multi-colored popsicles are made by filling ice pop pouches with dragon fruit and mango, but you prefer. Spending time outdoors in the summer does not have to mean being bitten by mosquitos. Keep the bugs at bay with these homemade natural citronella candles that are perfect for your yard. For the ultimate backyard BBQ build your own built-in BBQ complete with counters and pergola roof. This outstanding structure is sure to add value to your house and impress your neighbors. If you are serious about BBQing this DIY is for you! Keep your drink staying cool with a DIY fruit koozie that can be slipped around a bottle or can. Using the koozie, you can also identify your drink, by giving each person a different fruit design. For dessert serve corn macarons the perfect BBQ party dessert! You can decorate three vanilla macarons to look like a cob or corn using fondant and food coloring. Set your patio table with some DIY watermelon napkins that are perfect to use all summer. Best of all they are easy to make. Simply cut a sponge to make a watermelon stamp and stamp the design over white napkins. Salads are an important part of any backyard BBQ party, so serve it in a cute DIY watermelon bowl. Keep your clothes safe from getting stained while you cook by making your own BBQ apron. This stylish apron can also make a great gift. Build your own BBQ party station that will help you store drinks and cooking tools. You will love having the extra counter space when entertaining as it is perfect for holding trays of food and drinks. Meanwhile, the station also has drawers for storage and will keep an umbrella upright too. Make your BBQ more fun by inviting everyone to play a game together. Test everyone's memory by playing a matching game with paper popsicles. Using colored paper you can make your own popsicle memory game to play throughout the summer. Convert a 55-gallon barrel into a large BBQ perfect for grilling burgers and hot dogs this summer. Invite your neighbors and friends to a backyard BBQ party with these beautiful DIY invitations that you can make by stamping the design.